The 20,000 sf pre-engineered steel receiving canopy on an industrial campus. Schuchart was brought in early Conceptual Design to offer value cost analysis and value engineering ideas. The team evaluated various cost saving scenarios and determined a pre-engineered solution was the best fit for the project. 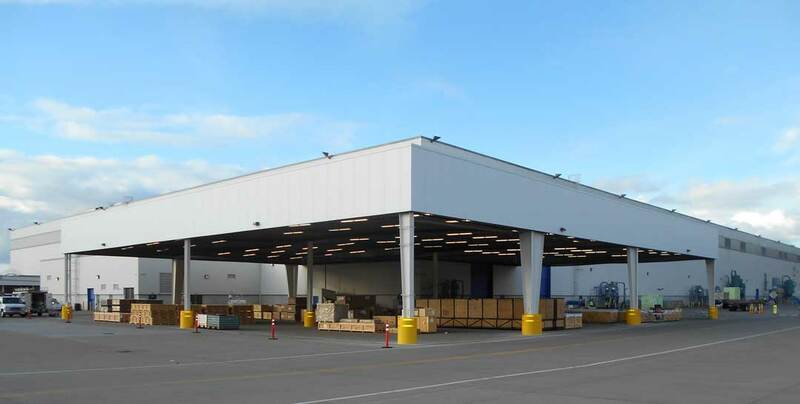 This solution provided the clear span column requirements at 62 ft, 70 ft and 77 ft. The construction involved extending the fire main 200 feet, adding an infiltration pit to collect roof water, trench drains, installing 9 ft x 9 ft x 3 ft earth-formed column footings, concrete bollards at columns, PVC roofing system, paint, new riser and dry fire sprinkler system, lighting, and bird screening.